At least 4,284 people, including 516 women and 539 children, were killed and 9,112 others injured in 3,472 road accidents across the country in 2017. The fatal accidents took place on several highways and national, inter-district and regional roads between January and December across the country, said a report of the National Committee to Protect Shipping, Roads and Railways (NCPSRR), a non-government organisation, on Monday. According to the report, the number of road accidents and casualties was higher in 2017 compared to 2016. A total of 3,412 people, including 470 women and 453 children were killed and 8,572 others were injured in 2,998 the road accidents in 2016. The NCPSRR report said the number of road accidents soared by 474 or 15.82 percent while the death toll jumped by 872 or 25.56 percent between 2016 and 2017. A total of 6,823 people, including 781 women and 762 children, were killed and 14,026 others were injured in 4,592 road accidents in 2015, According to NCPSRR data. NCPSRR identified reckless driving, a rise in the number of three-wheeler vehicles and motorbikes, overloading and overtaking tendency, ignoring traffic rules and regulation on long routes, long driving hours without any interval, risky turning points and dilapidated roads, plying of unfit vehicles and unskilled driver without driving licences as the key factors causing road accidents. 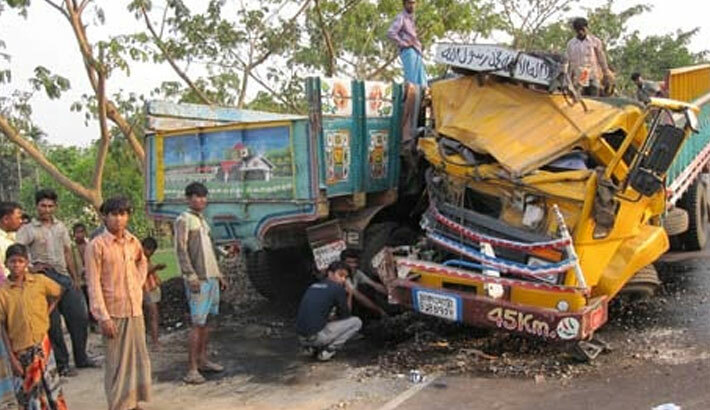 Ashis Kumar Dey, general secretary of NCPSRR, said lack of proper supervision and control by both the government and non-government authorities concerned and the lack of public awareness were the major reasons for the high number of road crashes.